Kayseri (Turkish pronunciation: [ˈkajseɾi]) is a large industrialised city in Central Anatolia, Turkey. It is the seat of Kayseri Province. The city of Kayseri, as defined by the boundaries of Kayseri Metropolitan Municipality, is structurally composed of five metropolitan districts, the two core districts of Kocasinan and Melikgazi, and since 2004, also Hacılar, İncesu and Talas. The city retains a number of historical monuments, including several from the Seljuk period. While it is generally visited en route to the international tourist attractions of Cappadocia, Kayseri has many attractions in its own right: Seljuk and Ottoman era monuments in and around the city centre, Mount Erciyes as a trekking and alpinism centre, Zamantı River as a rafting centre, and the historic sites of Kültepe, Ağırnas, Talas and Develi. Kayseri is served by Erkilet International Airport and is home to Erciyes University. According to the Turkish Statistical Institute, as of 2011[update] the city of Kayseri had a population of 844,656; while Kayseri Province had a population of 1,234,651. Kayseri was originally called Mazaka or Mazaca by the Hattians and was known as such to Strabo, during whose time it was the capital of the Roman province of Cilicia, known also as Eusebia at the Argaeus (Εὐσέβεια ἡ πρὸς τῶι Ἀργαίωι in Greek), after Ariarathes V Eusebes, King of Cappadocia (163–130 BC). The name was changed again by Archelaus (d. 17 AD), last King of Cappadocia (36 BC–14 AD) and a Roman vassal, to "Caesarea in Cappadocia" (to distinguish it from other cities with the name Caesarea in the Roman Empire) in honour of Caesar Augustus, upon his death in 14 AD. When the Muslim Arabs arrived, they adapted the pronunciation to their writing resulting in Kaisariyah (note that letter C in classical Latin was pronounced K), and this eventually became Kayseri when the Seljuk Turks took control of the city in circa 1080, remaining as such ever since. The city has been continuously inhabited since perhaps c. 3000 BC with the establishment of the ancient trading colony at Kültepe (Ash Mountain) which is associated with the Hittites. The city has always been a vital trade centre as it is located on major trade routes, particularly along what was called the Great Silk Road. Kültepe, one of the oldest cities in Asia Minor, lies 20 km away. The city was the centre of a satrapy under Persian rule until it was conquered by Perdikkas, one of the generals of Alexander the Great when it became the seat of a transient satrapy by another of Alexander's former generals, Eumenes of Cardia. The city was subsequently passed to the Seleucid empire after the battle of Ipsus but became once again the centre of an autonomous Greater Cappadocian kingdom under Ariarathes III of Cappadocia in around 250 BC. In the ensuing period, the city came under the sway of Hellenistic influence, and was given the Greek name of Eusebia (Greek: Ευσέβεια) in honor of the Cappadocian king Ariarathes V Eusebes Philopator of Cappadocia (163–130 BC). The new name of Caesarea (Greek: Καισάρεια), by which it has since been known, was given to it by the last Cappadocian King Archelaus or perhaps by Tiberius. The city passed under formal Roman rule in 17 AD. A portion of Basil's new city was surrounded with strong walls, and it was turned into a fortress by Justinian. Caesarea in the 9th century became a Byzantine administrative centre as the capital of the Byzantine Theme of Charsianon. The 1500-year-old Kayseri Castle, built initially by the Byzantines, and expanded by the Seljuks and Ottomans, is still standing in good condition in the central square of the city. Thus, there were three golden-age periods for Kayseri. The first, dating to 2000 BC, was when the city was a trade post between the Assyrians and the Hittites. The second golden age came during the Roman rule (1st to 11th centuries). The third golden age was during the reign of Seljuks (1178–1243), when the city was the second capital of the state. The short-lived Seljuk rule left a large number of historic landmarks; historic buildings such as the Hunat Hatun Complex, Kilij Arslan Mosque, The Grand Mosque and Gevher Nesibe Hospital. The Grand Bazaar dates from the latter part of the 1800s, but the adjacent caravanserai (where merchant traders gathered before forming a caravan) dates from around 1500. The town's older districts (which were filled with ornate mansion-houses mostly dating from the 18th and 19th centuries) were subjected to wholesale demolitions starting in the 1970s. The building that hosts the Kayseri lyceum was arranged to host the Turkish Grand National Assembly during the Turkish War of Independence when the Greek army had advanced very close to Ankara, the base of the Turkish National Movement. 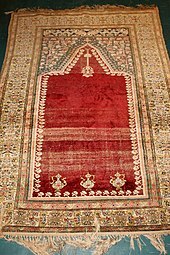 Today the city is famous for its carpet sellers. Kayseri has a cold semi-arid climate, Köppen climate classification (BSk) with cold, snowy winters and hot, dry summers with cool nights due to Kayseri's high elevation. Rainfall occurs mostly during the spring, early summer and late autumn. Thanks to the economic liberalisation policies introduced in the 1980s, a new wave of merchants and industrialists from Kayseri joined their predecessors. Most of these new industrialists choose Kayseri as base of their operations. As a consequence of better infrastructures, the city achieved a remarkable industrial growth since 2000 and is one of the key cities that characterises the class of Anatolian Tigers, with a favourable environment present especially for small and medium enterprises. Kayseri is connected to the rest of country with railway service. There are four trains per day to Ankara. To the east there are two branches: one to Kars, and another to Tatvan on the west shore of Lake Van. As the city is located in central Turkey, car and bus transportation are highly efficient. It takes approximately three hours to reach Ankara, approximately three hours to Mediterranean shores and 45 minutes to Cappadocia. The symbol of the city, Mount Erciyes, which is a notable ski centre in winters and accessible for trekking in summertime, is at only 30 minutes' drive from the city centre. The Erciyes Ski Resort at Mount Erciyes is one of the largest ski resorts in Turkey. Kayseri is home to 2 state and 1 private universities. Kayseri is renowned for its culinary specialities such as mantı, pastırma and sucuk. 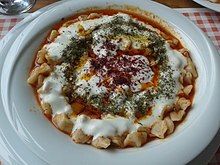 Mantı is the most popular dish in Kayseri for the local people and tourists. Another speciality is stuffed zucchini flowers made with Köfte, garlic and spices. Nevzine is a traditional dessert. ^ "Turkey: Major cities and provinces". citypopulation.de. Archived from the original on 2015-02-24. Retrieved 2015-02-08. ^ ESI. "Islamic Calvinists: Change and Conservatism in Central Anatolia" (PDF). European Stability Initiative, Berlin. Archived (PDF) from the original on 2005-12-10. Retrieved 2005-09-19. ^ "2011". citypopulation.de. Archived from the original on 14 January 2017. Retrieved 29 April 2018. ^ "Türkiye İstatistik Kurumu". Archived from the original on 2016-03-04. ^ a b c Everett-Heath, John (2005). "Kayseri". Concise Dictionary of World Place-Names. Oxford University Press. Retrieved 2007-12-11. ^ "CATHOLIC ENCYCLOPEDIA: Caesarea". Archived from the original on 2007-07-02. ^ Tore Kjeilen (2005-10-17). "Kayseri – LookLex Encyclopaedia". Lexicorient.com. Archived from the original on 2012-03-14. Retrieved 2012-08-13. ^ Richard Price, Michael Gaddis The Acts of the Council of Chalcedon, Volume 1 p31. ^ Richard Price, Michael Gaddis, The Acts of the Council of Chalcedon, Volume 1 p36. ^ Heinrich Gelzer, Ungedruckte und ungenügend veröffentlichte Texte der Notitiae episcopatuum, in: Abhandlungen der philosophisch-historische classe der bayerische Akademie der Wissenschaften, 1901, p. 536, nº 77–82, and pp. 551–552, nnº 106–121. ^ "Caesarea". Catholic Encyclopedia. Archived from the original on 2007-07-02. ^ Ostrogorsky, George. History of the Byzantine State. New Jersey: Rutgers University Press, 1969. Pg 116. ^ a b Ash, John (2006). A Byzantine journey ([2. ed.] ed.). London: Tauris Parke Paperbacks. p. 167. ISBN 9781845113070. In that year the Turks captured Caesarea, the chief city of eastern Cappadocia, burnt it to the ground, massacred its inhabitants and descrated the great shrine of Saint Basil. ^ www.virtualani.org. "Armenian Architecture – VirtualANI – The Traditional Houses of Kayseri". Archived from the original on 2007-05-23. ^ "Resmi İstatistikler: İllerimize Ait Genel İstatistik Verileri" (in Turkish). Turkish State Meteorological Service. Archived from the original on 16 January 2019. Retrieved 16 January 2019. ^ "December Climate History for Kayseri | Local | Turkey". Myweather2.com. Archived from the original on 2012-03-20. Retrieved 2012-08-13. ^ "KAYSER -Kayseri Serbest Bölgesi". Archived from the original on 2013-12-05. ^ "Chronology of all ESI publications – Reports – ESI". Esiweb.org. 2005-09-19. Archived from the original on 2012-06-03. Retrieved 2012-08-13. ^ Tore Kjeilen (2005-10-17). "Kayseri – LookLex Encyclopaedia". I-cias.com. Archived from the original on 2012-08-02. Retrieved 2012-08-13. ^ "Mostar Gradovi prijatelji" [Mostar Twin Towns]. Grad Mostar [Mostar Official City Website] (in Bosnian). Archived from the original on 2013-11-06. Retrieved 2017-02-21. This page was last edited on 5 April 2019, at 12:12 (UTC).